Heat large, deep skillet over MEDIUM HIGH. Add oil and cooking spray, let these heat up while cutting the broccoli. Turn the broccoli over a few times with a spatula to distribute the oil. 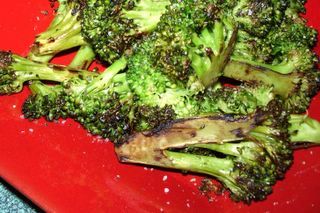 Roast the broccoli for 8 - 12 minutes, stirring often, until the broccoli is lightly browned and crisp tender. Remove from the heat. Add balsamic vinegar. Season to taste with salt and pepper. This was so good! I was looking for a recipe with broccoli preferably with zero points. This is it!! Even my 4 yr old likes it. It's so good I don't want to share it at the dinner table. Thank you!